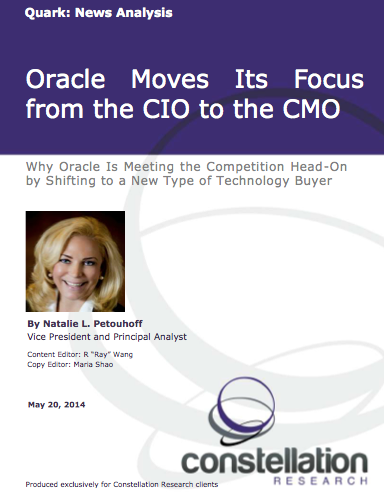 Oracle Moves Its Focus from the CIO to the CMO | Constellation Research Inc. Wondering how Oracle is going to compete for its share of the marketing and social technology budget? The mega-vendor is shifting its focus from the standard buyer of technology (the IT department) to line-of-business buyers such as the CMO. The announcement made at the Oracle Marketing Cloud launch event April 30, 2014 provides insight into where major players like Oracle think the market is headed. Perhaps for some vendors, it’s time to say goodbye to IT and hello to the CMO. Or it’s time for IT and the CMO to collaborate. How that can all happen is the topic of this paper. It’s not just about the technology. It’s about the people, the processes and the technology that together, when used with purpose and great leadership, can provide unprecedented results.